BJU’s Computer Science team won first place in the 2016 Division II ACM Southeast USA Competition. Computers and the Internet are integral parts of business, ministry, education and just about every facet of life. If you’re interested in creating solutions as part of this ever-changing technology field, BJU’s computer science program is for you. You’ll learn common programming languages and fundamental concepts as recommended in the ACM’s 2013 Computer Science Curriculum Guidelines. Also, you will learn to evaluate and access software technologies and then communicate this information effectively. Our Christ-centered, knowledgeable faculty and hands-on courses will equip you to excel in your field, be flexible in your job and live a God-honoring life. In the competitive field of computing, you need the skills and knowledge to provide solutions to the real-world problems and the ability to present the solutions to employers. 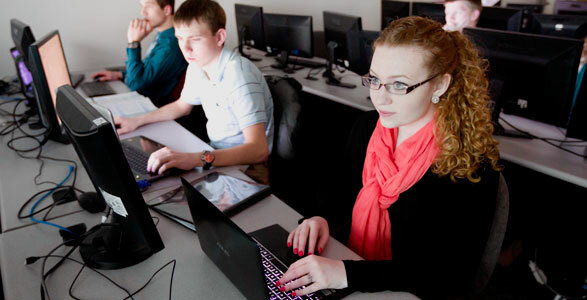 BJU’s computer science program is designed to give you the necessary foundational knowledge in math and computing and then to give you hands-on opportunities to apply that knowledge in real-life situations. During the freshman year, students learn two programming languages, C# and C++, and are given overviews of various software development skills such as web applications, GUI programming and team programming. Throughout the rest of your program, you will take low-level computing courses including microprocessor architecture, operating systems and assembly programming. Students analyze and create a compiler and interpreter for various programming languages. Computer security is a highlight of the senior year. Internships and student work experiences are generally available as well. 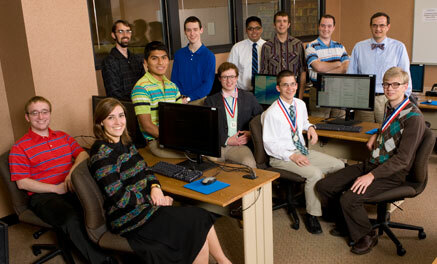 BJU’s computer science program will equip you for graduate studies and a wide variety of computing, programming and software research and development job opportunities. Having a broad base of knowledge and experience will help prepare you for whatever opportunities the Lord brings your way. Bible and the liberal arts courses (such as history, economics, English and speech) will give you the tools to relate to a wide range of people and to clearly communicate. We want to equip you to be a fruitful, flexible servant of Christ. The computer science program gives you entrance into an array of occupations. Your electives may be taken to strategically position you, as in the case of business, criminal justice or the sciences. They may also prepare you for specific jobs in the field, such as management, technical documentation or design. College is also a time to challenge yourself. So don’t hesitate to use electives to explore a field of interest that’s not related to computer science. Those courses may be just what God will use to specifically prepare you for work and service. Senior software engineer at Gnoso Inc. I started my college career like so many other students—knowing that I needed to get an education, but having no clue or leading toward a field of study. My gifts and abilities were in math and engineering, so based on the advice of a family friend, I decided to pursue a physics/pre-engineering major. I enrolled at BJU because I had limited formal Bible training and I wanted that most of all. If a minor in Bible had been available, that would have been my choice. With this general direction I enrolled at BJU and received my first introduction to computer science as an elective. That elective choice identified my academic and professional passion. Changing my major to computer science with a math minor, I pursued my education and secured my first job as a software developer while still in my senior year at BJU. I consider myself to be one of those rare individuals who get paid every day to do exactly what God gifted them to do and enjoy. 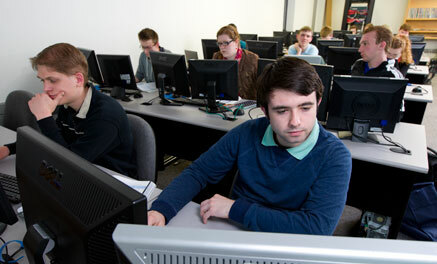 Our computer science graduates are employed in a variety of computing jobs, from programming to network administration to computer support. The following is a sample of careers our graduates have pursued. While there are many jobs in the computer science field, not all of our graduates go into computer science jobs. Some go into other math-related fields, such as statistics, or into graduate studies in other fields. Some choose to use their skills to assist churches, missionaries, Christian ministries and Christian schools. BJU offers students a variety of ways to network with employers and organizations. A multitude of job opportunities are posted each year on Career Central, our online job board. In addition, over 60 businesses and 150 Christian schools/mission boards/Christian organizations come on campus to recruit students through on-campus interviews and job/ministry fairs. The Career Services office also helps students by holding seminars on resume preparation and interview techniques. Employers in the Greenville area recognize the high caliber of our students and often seek them out. Our students have interned at local and out-of-state companies including Booz Allen, Oak Ridge National Laboratory, Answers in Genesis, Worthwhile, and Follet Software Corp/Tetradata. Our faculty members have plenty of practical experience in addition to their work as professors. They’ve spent time in the industry in consulting, directing web development, software developing and information technology work. One of our faculty members even holds a patent for the networking capability our vending machines use. You’ll be sure to receive a down-to-earth education in preparation for your postgraduate future. Design and implement efficient solutions to problems in various domains. Apply fundamental concepts in computer science. Communicate technical information effectively, including software design and requirements documents. Evaluate and assess software technologies for use in solving specific problems.